Papers for the regular issues of the journal can be submitted, round the year, electronically at submit2@ijrte.org, ijrtej@gmail.com After the final acceptance of the paper, based upon the detailed review process, the paper will immediately be published online. However, assignment of the paper to an specific Volume / Issue of the Journal will be taken up by the Editorial Board later; and the author will be intimated accordingly. For Theme Based Special Issues, time bound Special Call for Papers will be announced and the same will be applicable for that specific issue only. Submission of a paper implies that the work described has not been published previously (except in the form of an abstract or academic thesis) and is not under consideration for publication elsewhere. The submission should be approved by all the authors of the paper. If a paper is finally accepted, the authorities, where the work had been carried out, shall be responsible for not publishing the work elsewhere in the same form. Paper, once submitted for consideration in IJRTE/BEIESP, cannot be withdrawn unless the same is finally rejected. Submission of a manuscript implies: that the work described has not been published before; that it is not under consideration for publication anywhere else; that its publication has been approved by all co-authors, if any, as well as by the responsible authorities – tacitly or explicitly – at the institute where the work has been carried out. The publisher will not be held legally responsible should there be any claims for compensation. Title Page: The title page should include the name(s) of the author(s), a concise and informative title, the affiliation(s) and address(es) of the author(s), the e-mail address, and mobile number(s) of the corresponding author. Abstract: Please provide an abstract of 150 to 450 words. The abstract should not contain any undefined abbreviations or unspecified references. Keywords: Author(s) should provide 4 to 6 keywords which can be used for indexing purposes. Text Formatting: Paper Setup must be in A4 size with Margin: Top 1.78 cm, Bottom 1.78 cm, Left 1.78 cm, Right 1.65 cm, Gutter 0 cm, and Gutter Position Top. Paper must be in two Columns after Authors Name with Width 8.59 cm, Spacing 0.51 cm. Whole paper must be with: Font Name Times New Roman, Font Size 10, Line Spacing 1.05 EXCEPT Abstract, Keywords (Index Term), Paper Tile, References, Author Profile (in the last page of the paper, maximum 400 words), All Headings, and Manuscript Details (First Page, Bottom, left side).Paper Title must be in Font Size 24, Bold, with Single Line Spacing. Authors Name must be in Font Size 11, Bold, Before Spacing 0, After Spacing 16, with Single Line Spacing. Please do not write Author e-mail or author address in the place of Authors name. Authors e-mail, and their Address details must be in the Manuscript details. Abstract and Keywords (Index Term) must be in Font Size 9, Bold, Italic with Single Line Spacing. All MAIN HEADING must be in Upper Case, Center, and Roman Numbering (I, II, III…etc), Before Spacing 12, After Spacing 6, with single line spacing. All Sub Heading must be in Title Case, Left 0.25 cm, Italic, and Alphabet Numbering (A, B, C…etc), Before Spacing 6, After Spacing 4, with Single Line Spacing. Manuscript Details must be in Font Size 8, in the Bottom, First Page, and Left Side with Single Line Spacing. References must be in Font Size 8, Hanging 0.25 with single line spacing. Author Profile must be in Font Size 8, with single line spacing. Introduction: State the objectives of the work and provide an adequate background, with a detailed literature survey or a summary of the results. Theory/Calculation/Methodology: A Theory Section should extend, not repeat the information discussed in Introduction. In contrast, a Calculation Section represents a practical development from a theoretical basis. Result: Results should be clear and concise. Discussion: This section should explore the importance of the results of the work, not repeat them. A combined Results and Discussion section is often appropriate. Conclusion and Future Scope: The main conclusions of the study may be presented in a short Conclusion Section. In this section, the author(s) should also briefly discuss the limitations of the research and Future Scope for improvement. Appendix: If there are multiple appendices, they should be identified as A, B, etc. Formula and equations in appendices should be given separate numbering: Eq. (A.1), Eq. (A.2), etc. ; in a subsequent appendix, Eq. (B.1) and so on. Similar nomenclature should be followed for tables and figures: Table A.1; Fig. A.1, etc. Acknowledgement: If desired, authors may provide acknowledgements at the end of the article, before the references. The organizations / individuals who provided help during the research (e.g. providing language help, writing assistance, proof reading the article, sponsoring the research, etc.) may be acknowledged here. References: Citation in text- Please ensure that every reference cited in the text is also present in the reference list (and vice versa). The references in the reference list should follow the standard IEEE reference style of the journal and citation of a reference. Web references- As a minimum, the full URL should be given and the date when the reference was last accessed. Any further information, if known (DOI, author names, dates, reference to a source publication, etc. ), should also be given. Web references can be listed separately (e.g., after the reference list) under a different heading if desired, or can be included in the reference list, as well. Reference style: Text- Indicate references by number(s) in square brackets in line with the text. The actual authors can be referred to, but the reference number(s) must always be given. Example: ‘….. as demonstrated [3,6]. Barnaby and Jones  obtained a different result ….’ List- Number the references (numbers in square brackets) in the list, according to the order in which they appear in the text. example:  G. O. Young, “Synthetic structure of industrial plastics (Book style with paper title and editor),” in Plastics, 2nd ed. vol. 3, J. Peters, Ed. New York: McGraw-Hill, 1964, pp. 15–64. Ensure that each figure / table has been numbered and captioned. Supply captions separately, not attached to the figure. A caption should comprise a brief title and a description of the illustration. Figures and tables should be numbered separately, but consecutively in accordance with their appearance in the text. Online publication of color illustrations is free of charge. There is no any extra charges. All proprietary rights other than copyrights, such as patent rights. The right to use all or part of this article, including tables and figures in future works of their own, provided that the proper acknowledgment is made to the Publisher as copyright holder. The right to make copies of this article for his/her own use, but not for sale. It is the responsibility of each author to ensure that papers submitted to the journal are written with ethical standards in mind, concerning plagiarism.Please note that all submissions are thoroughly checked for plagiarism. If an attempt at plagiarism is found in a published paper, the authors will be asked to issue a written apology to the authors of the original material. Any paper which shows obvious signs of plagiarism will be automatically rejected and its authors may be banned for duration of 01 years from publishing in Journal. The authors will receive proper notification if such a situation arises. This paper has not been published in the same form elsewhere. It will not be submitted anywhere else for publication prior to acceptance/rejection by this Journal. For any dispute or related violence, it will be discussed and considered only in front of ‘Judiciary of Bhopal’ at Bhopal, Madhya Pradesh, India. One set of page proofs (as PDF files) will be sent by e-mail to the corresponding author or a link will be provided in the e-mail so that the authors can download the files themselves. These PDF proofs can be annotated; for this you need to download Adobe Reader version 7 (or higher) available free at get.adobe.com/reader If authors do not wish to use the PDF annotations function, they may list the corrections and return them to IJRTE in an e-mail submit2@ijrte.org, ijrtej@gmail.com. Please list corrections quoting line number. If, for any reason, this is not possible, then mark the corrections and any other comments on a printout of the proof and then scan the pages having corrections and e-mail them back, within 05 days. Please use this proof only for checking the typesetting, editing, completeness and correctness of the text, tables and figures. Significant changes to the paper that has been accepted for publication will not be considered at this stage without prior permission. It is important to ensure that all corrections are sent back to us in one communication: please check carefully before replying, as inclusion of any subsequent corrections cannot be guaranteed. Proofreading is solely authors’ responsibility. 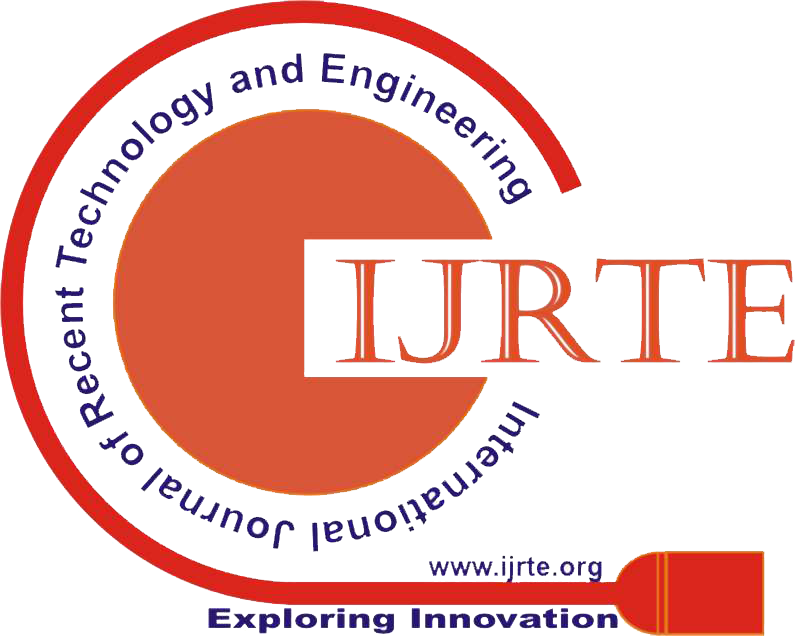 Note that IJRTE will proceed with the publication of paper, if no response is received within 05 days.